Today's post is about two Marcelle products I bought last week (one being a re-purchase) that I think are really great products! Marcelle Essentials Oil Free Multi-Defenese Lotion : I mouthful I know! But this lotion is AMAZING (especially if you have oily skin like I do). This lotion is actually a re-purchase. I used to use this lotion about a year ago before I tried Aveeno's Fresh Essentials Daily Moisturizer (I mention it in my Daily Skin Care for Oily Skin here). I really like Aveeno's moisturizer, but I have to say after I've gone back to this one I find it a lot heavier - most likely because this is a lotion and Aveeno is a moisturizer. I really like the constancy of this lotion, it has SPF 15 in it, and the biggest thing (for me) is it is oil free! I have to say, I don't think I'll be trying any other daily lotions for a while, I'll just stick to this one because I know it works for me. Marcelle BB Cream in Light to Medium : I've been using this for about a week now instead of my Mac Studio Sculpt (in NW15), and I've taken a real liking to this BB Cream. I've tested Garnier's BB Cream (you can read Kelsey's review on it here), and I didn't really like it. I think what I really like about this one is it have a slightly thicker consistency (which I like to hide some of blemishes and red spots) and covers my face really well. It's also hypo-allergenic which is great for me because I do get allergic reactions when I put some products on my face. I know a week really isn't long enough to see if the BB Cream shows results on my face, so I'll do a full review on this product in about a month's time. 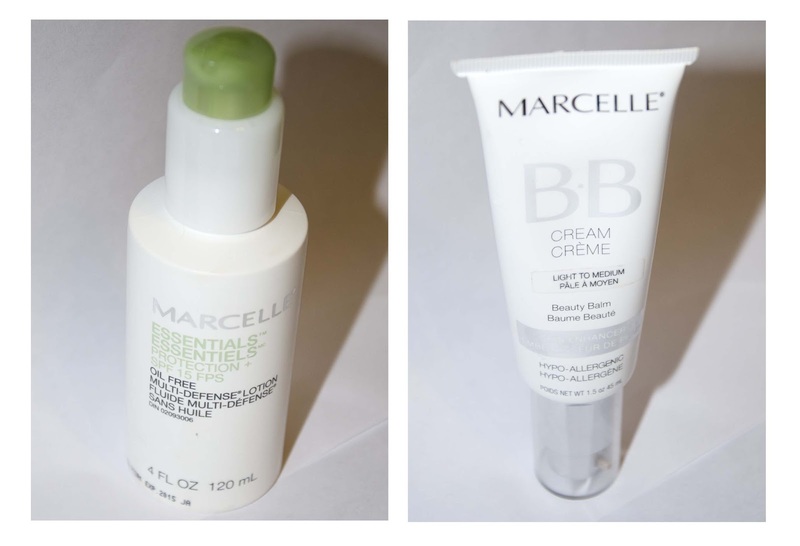 Have any of you tried Marcelle's BB Cream? And did you think it worked? I'd love to hear your thoughts!